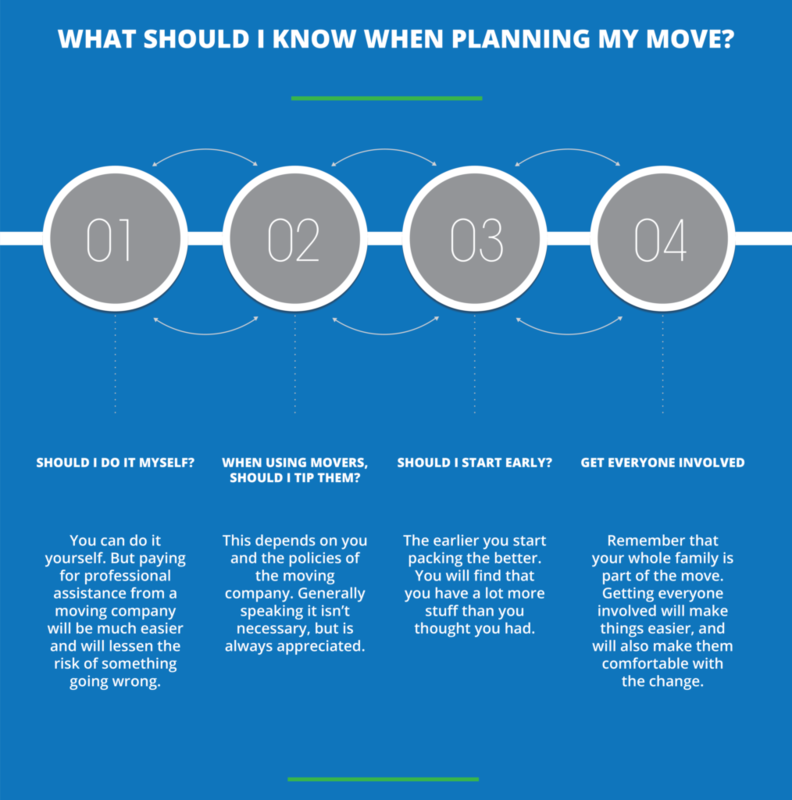 What should I Know when I Plan my Move? Should I hire movers or do it myself? This question plagues many people when they are in the process of moving. And like many other decisions, the answer varies for everyone, depending on factors such as money, time and complexity of the move. How do I find reliable movers? Hiring a moving company is the biggest decision you will have to make once you decide where and when you are moving. It is also one of the costliest part of your move, so make sure you hire reputable movers in order to have a smooth move and your furniture arrives the same way you left it. One of the most commonly asked questions about moving is whether you are required to tip the movers and if so, how much. When you have chosen your preferred moving company, find out if you are required to tip the movers and what the average amount should be. What is the best way to assist my family move? g to and talking to your children about moving. It is important to remember the psychological and emotional aspects of a move is more important than the move itself. Saving money is extremely important, especially when moving. With an ever increase of petrol prices, moving is a lot pricier than ever before, especially when moving to another city or country. How do I settle my family in the new home? Moving into your new home and settling in can be very exciting. As worn out and tired you may feel after the move, you will find yourself geared up to settle in and enjoy the new house. Although you might be excited and ready to unpack, make sure that everyone has a good night’s rest and ready to complete the rest of your unpacking. Looking for a moving company in Johannesburg? Visit Better Moves for more information on our services and enquire online for a quotation today!